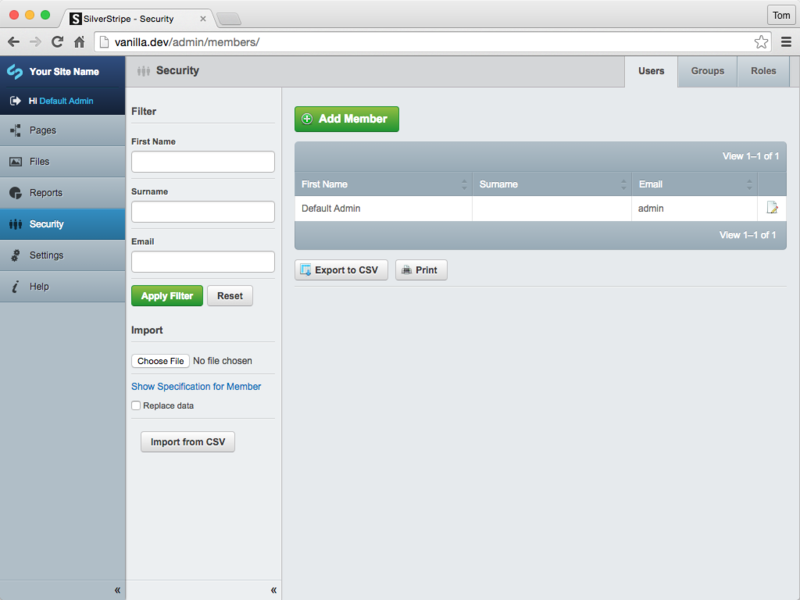 Enhanced SilverStripe CMS security section for managing members, groups, and roles. unclecheese/betterbuttons: Improves the usability of ModelAdmin based interfaces. silverstripe-australia/gridfieldextensions: Allows better Member lookup when editing a Group. SilverStripe CMS 3.1.15 and newer or 3.2 and newer. Copy the 'silverstripe-security' folder to the root of your SilverStripe installation. The model provides a drop in replacement for the default 'Security' section in the SilverStripe CMS. This 'Security' section replacement is based on ModelAdmin and provides simple filtering which is good for managing sites with large numbers of users/groups. Create ModelAdmin base drop in for current security section. Add options for admins to control available fields for members.